Free shipping when you order at least 10 wall plaques! 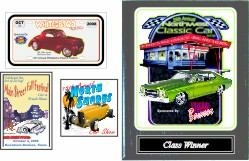 Sizes 2" x 3" 2½" x 2½" 1½" x 4"
Sizes 3" x 4" 3½" x 3½"
Prices are for aluminum dash plaques, add $.40 per piece for brass dash plaque. We can also make acrylic or plastic dash plaques. Go with acrylic or plastic if you want a shape other than rectangle or square. Price will depend on the size, shape and quantity. 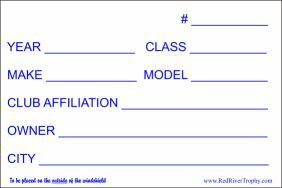 Static Cling Registration Forms - Clubs Love Them! You can order stock design registration forms or custom made for your car show or club with your artwork! These are designed to go on the outside of the windshield and are easily written on using a Sharpie type pen. The size is approximately 5" x 7.5". If you're looking for a nice cost effective award, these are it! 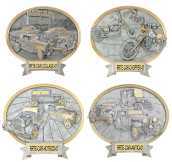 These awards can stand on a desk or hang on the wall, and there are several different choices including diner scenes, muscle cars, motorcycles, etc. These provide a really nice cost effective award. 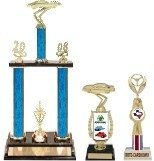 We also have traditional trophies. These can be made most any size and you have lots of figures to choose from. Price depends on the size, figure and quantity. Normally trophies are more expensive than plaques. A cost effective solution is to limit the trophies to the Best of Show and specials and do plaques or ovals for the Class Winners. Want something different - just call 1-888-707-8889 or email with any questions.